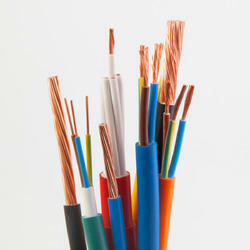 Offering you a complete choice of products which include polycab wires & cables. We have earned immense reputation since our establishment by providing Polycab Electrical Wire to our customers. The wire is used in various electrical power distribution and transmission applications. Available with us in various lengths and thicknesses, it is designed and manufactured using superior quality raw material as per the set industry norms. Our customers can avail this from us at market leading prices and that too within the assured time frame. We are the leading suppliers of Polycab Electrical Wirein Coimbatore, Mettupalayam,chennai,Salem, Tirupur, Pollachi, Trichy, Salem, Erode, Madurai, Tirunelveli , Chennai, Nagarkovil, Kanniyakumari,Tuticorin, Namakkal, Vellore,Theni, Dindugul, Ooty, Kunoor, Valparai, Kodaikanal, Kannur, Kozhikode, Malappuram, Palakkad, Wyanad, Kasargod, Kalpatia, Thrissur, Eranakulam, Iduki, Kootayam, Alapuzha, Kollam, Thiruvananthapuram, Bangalore, Tamilnadu, Karnataka, Andrapradesh, And Kerala.